Njandu / Crab Roast | Simple and Delicious ! I had to wait to reach Dubai to try out some crab recipes! Back home in Kerala, no one likes it, and they are even afraid to watch it.. :) There, kids are familiar with crabs only when the fish vendor shows them, the crabs he got with other fishes accidentally.This is a simple recipe for cooking crabs as we usually do for prawns. Heat oil, saute chopped onions until transparent. Add ground paste, stirr for one minute. Put chopped tomatoes, with pepper powder,salt,curry leaves, turmeric powder and chilly powder. Stir and cook until tomatoes are mashed well. Close the pan, cook crab on a low flame. Check after 5 minutes,if there is no water, pour 1/4 cup water and mix well. Add vinegar, mix and check for salt, if needed add more. Add garam masala, coriander leaves and mix well. If you need more sourness increase the amount of vinegar. I like crab anything and this looks really good. 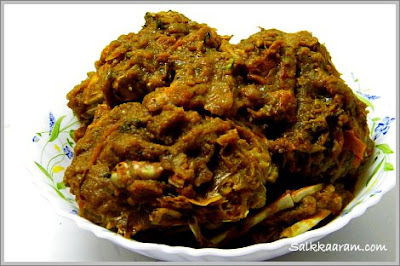 evide chennalum manushyane veruthe vidaruthu ketto...yummy yum..seens,hope you and everyone is enjoying !! I ve to go India to taste this crab Seena. I will die for this seafood! Looks excellent! I love crab and long since I had it. Your picture makes me crave for some rite now.. I never had crab in my life. don't know how to clean it...i have heard that some people get allergy after eating crabs. hope u r enjoying dubai vacation. That was really great. My family loved it. I get a lot of great how-to ideas on Wacanai.com(http://www.wacanai.com/intro). You should post this one there. I think a lot of people would like it. You can link your webpage to the website too. It is has some great articles on it and when people search for things with similar items or ingredients your article will pop up. I can't believe that no one back home likes it. I would give anything for my screen to become real so that I could eat this fantastic dish you have made. i just had some really good crab and ur post is making me crave more!! so u had a dubai trip! how was it? Your new look is really awesome,it gives a nice impression than before! 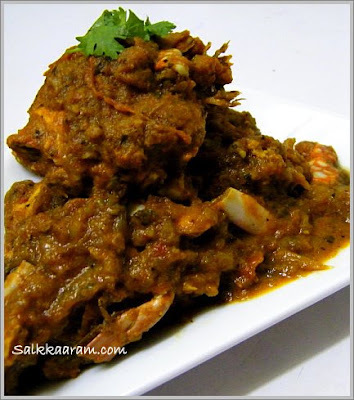 I love crab dishes like this, unlike you i have to wait till i am in Kerala to eat them. i tried your various recepies then my husband likes all items. and you are my guru and i would like to see. Will try to see you, insha Allah..